Replace a broken speaker in an iPhone 5s. Any tricks to getting the antenna cable fastened back in place? How important is this antenna cable? I’ve spent 2 hours trying to get it back in and I’m pretty much ready to give up on it. There was no adhesive on my cable. I ended up pushing it in until it stuck enough that it stayed there until something touched it, then I screwed its cap on over it to hold it into place. It is definitely not flush in the socket, but I think it has the connection it needs and is held there by the metal plate; I can’t see any differences in the operation of my phone. 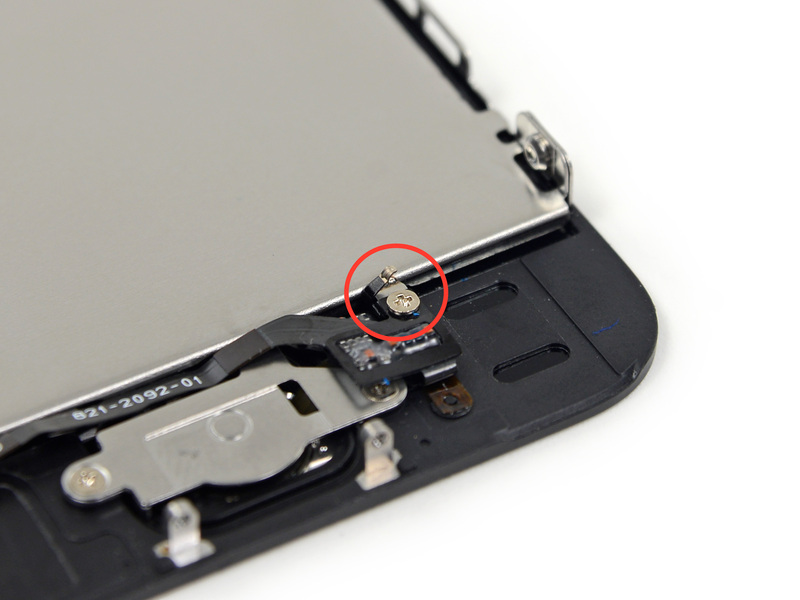 I stripped the smallest screw - 1.5 mm (orange circle) but the next day using a rubber band I removed it. I have new screws on order. On my 5S there is a "sticker tab" holding in the speaker piece. I removed it with the tweezers, and a very small metal clasp came off. I tried for about 20 minutes to put it back on, but decided it was a lost cause and didn't look very important anyway. Phone works fine now (guess it really wasn't important) but none of these steps are in the guide. I'll try adding them now. This description differs from the video. In the video you are stepped through removing the logic board. She describes 7 screws, phillips and flat, which secure the logic board. My 5s doesn't have the flat heads and also doesn't total 7 as far as I can see. Which instruction is correct? The video or the step by step? Both the Speaker and the Lightning Connector can be removed without removing the Logic Board. Just keep in mind that the top left of the Speaker is tucked under the Logic Board, and the middle left is tucked under the Touch ID connection. You need to Swivel it out. Also when replacing, make sure the Antenna doesn’t get caught underneath the Speaker. There is a little metal bracket that clamps over the bottom right screw hole on the speaker. There is nothing that holds it on. It fell right off of mine when I pulled out my speaker. If I hadn’t seen it fall, I’d never have known. You can see that metal bracket in the photos by the operators right Index finger. 73 other people completed this guide.